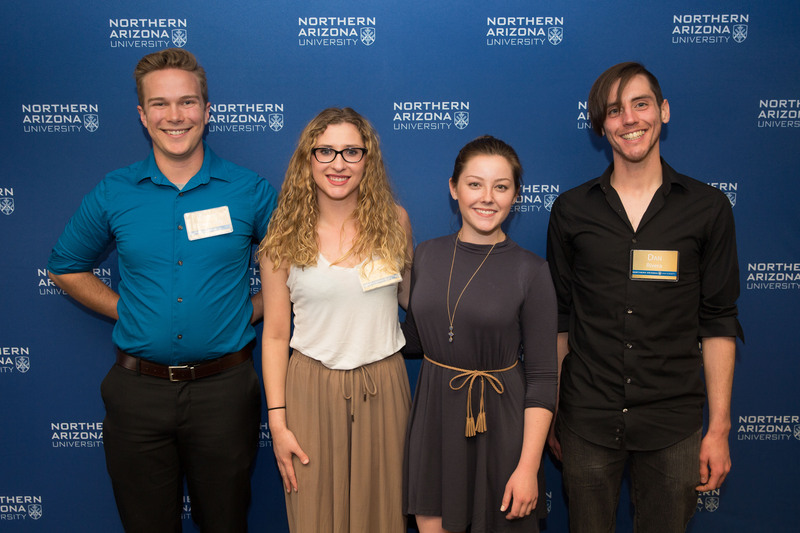 For the first time in the school’s history, three Northern Arizona University students have been selected as Goldwater Scholars. The prestigious award, given to undergraduate students studying natural sciences, mathematics or engineering, provides one- or two-year full-ride scholarships to each of the recipients. This year, 1,280 STEM students were nominated by campus representatives from more than 2,000 colleges and universities nationwide. Among the 211 selected to receive scholarships for the 2018-19 academic year were NAU biology students Austin Dikeman and Shelby Hutton and mechanical engineering student Dan Rivera. An additional 281 nominees were named as honorable mentions. With the support of their mentors and the help of these scholarships, these students have big plans for the future. 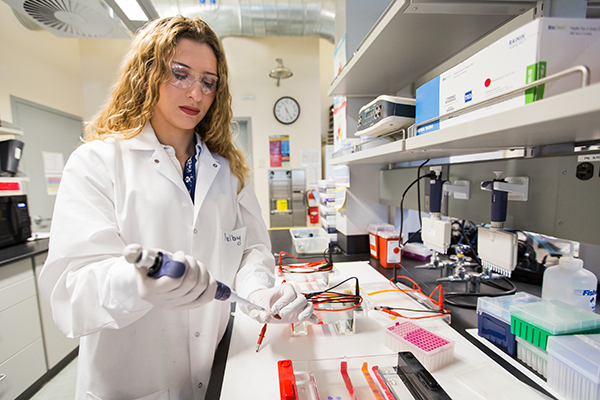 Dikeman, whose mentors are assistant research professor Faith Walker, School of Forestry professor Carol Chambers and research specialist Daniel Sanchez, hopes to obtain a Ph.D. in molecular genetics and conduct collaborative research on epigenetics and human genetic diseases. Hutton, mentored by biology professor David Wagner, associate director of the Pathogen & Microbiome Institute Joseph Busch and senior research specialist Nathan Stone, intends to pursue a Ph.D. in veterinary microbiology, focusing on research in vector-borne and zoonotic diseases. She hopes to eventually conduct research in a governmental position. Rivera, who plans to earn a Ph.D. in bioengineering and research biomimetic robotic control systems and their potential to treat human disabilities, plans to teach bioengineering with a focus on biomimetic design at the university level. His mentors include Katherine Strausser of Ekso Bionics Inc., Richard Casler of Ottobock Healthcare LP, mechanical engineering professor Zachary F. Lerner and Regents’ Professor Kiisa C. Nishikawa. From left to right, Etude O’Neel Judy, Goldwater Scholar 2017, Physics; and 2018 Goldwater Scholars Shelby Hutton, Biology; Austin Dikeman, Biology; and Dan Rivera, Mechanical Engineering. Over the past two decades, NAU students have received 16 Goldwater scholarships. In 2017, NAU was the only Arizona university to have a Goldwater Scholar—physics major Etude O’Neel Judy. This year, NAU is one of 11 universities to have three scholars. Others include Stanford, Harvard, Duke and Johns Hopkins. The foundation, which was established by Congress in 1986 to honor the life work of Sen. Barry Goldwater, has bestowed 8,132 scholarships worth approximately $65 million to date. Goldwater Scholars, who virtually all plan to obtain a Ph.D., have garnered the attention of prestigious post-graduate fellowship programs. Recent Goldwater Scholars have been awarded 91 Rhodes Scholarships, 131 Marshall Awards, 150 Churchill Scholarships, 100 Hertz Fellowships and numerous other distinguished awards like the National Science Foundation Graduate Research Fellowships. Chair of the Biology Department. It says a lot about the quality of the work the students and faculty of NAU are doing. Great work! We are so proud of you Shelby Hutton.